After passing through the Hong Gate, one must go through the Li Gate to get to the Lingxing Gate and Pan Pond. 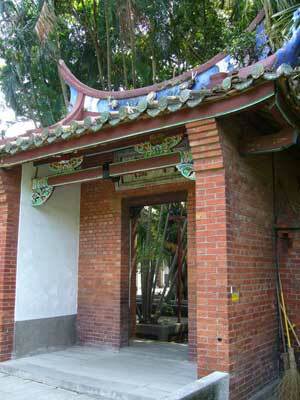 The Li Gate and Yi Lu Path are on the left and right of the main building of the Confucius Temple, are the entrance to the main building. The designs of these two doors are simple, with only one door. There is a three-arch stone bridge, the Pan Bridge, over the Pan Pond of the Taipei Confucius Temple. The bridge is arched like a rainbow and the balustrades on each side are carved like bamboo. Pillar heads between the balustrades are carved in the shape of brush tops. These beautiful designs symbolize noble character, incorruptible principles and prospering literature. They are well worth looking at carefully. There was an interesting story about the Pan Bridge over the Pan Pond. It was said that in ancient times, if a place produced a scholar who was first place in the civil service examinations which was presided over by the emperor, the residents of that area could walk through the Pan Bridge, Lingxing Gate and Yi Gate, and straight into the Dacheng Hall to worship Confucius. However, some Confucius temples do not have a Pan Bridge.